We're down to our last package of okra in the freezer. Have one bag of blueberries and one container of chicken and vegetable soup left from last year's fruits and vegetables. Come on Spring and warm weather. 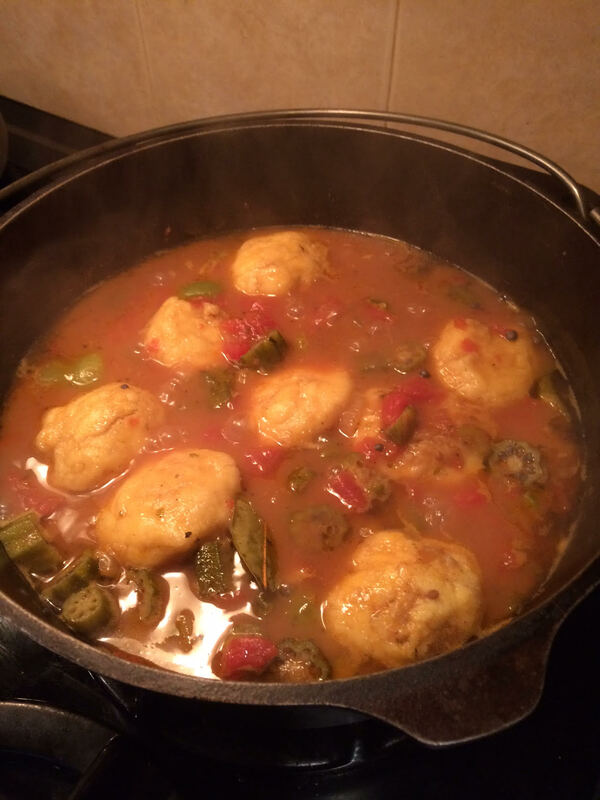 My version of Okra and Tomato Stew With Dumplings can be made with frozen, store-bought okra, so do give this comfort food favorite a try. Okra and Tomato Stew With Dumplings is comfort food on chilly days. Serves 4 to 6. Recipe is by Tommy Simmons. In a large Dutch oven, heat the olive oil over medium high heat. Stir in onions, celery and bell pepper and sauté until softened, stirring constantly. Add garlic and continue cooking until garlic is light golden (don't burn the garlic, as it cooks quickly and will be too crunchy if burned). Add canned tomatoes and frozen okra to the sautéed vegetables and season. Pour in chicken broth and continue cooking until everything is bubbly and vegetables are tender. Combine dumpling ingredients, except for the shredded Cheddar cheese. To make certain the dumplings hold together, add the milk slowly. You want the dumplings spoonable. Drop dumpling dough by spoonfuls into the simmering stew. Cover and cook over medium-low heat for 10 to 15 minutes or until dumplings are firm and cooked through. Serve immediately into individual soup bowls. Garnish each serving with a little shredded Cheddar cheese.